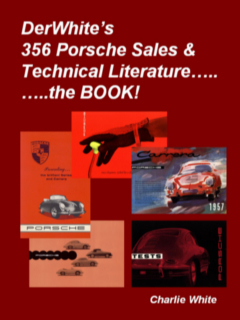 DerWhite's 356 Porsche Color Charts! Scroll down for scans of 356-C Porsche Interior Carpet Samples! The purpose of this website is to set down in one place as much information as can be found concerning paint colors for 356 Porsches for the years 1950-1965. Paint matching today is one of the most vexing problems associated with restoring a 356 Porsche. Below you will find images of the factory color charts, a listing of paint colors with color numbers and door plate numbers, and much more. The following 356 Porsche factory color charts in order of presentation are for the: 356-A, 356-B T-5, 356-B T-6, and 356-C. unfortunately, color charts do not reproduce very well in a scanner, so........don't depend on these images for accurate colors. Another factor, these color charts are as much as 43 years old! There is some useful information on these color charts, including 356 Porsche color numbers, and information about paint and interior combinations. 1. Actual Factory color charts for 356-A, 356-B T-5, 356-B T-6, & 356-C.
3. 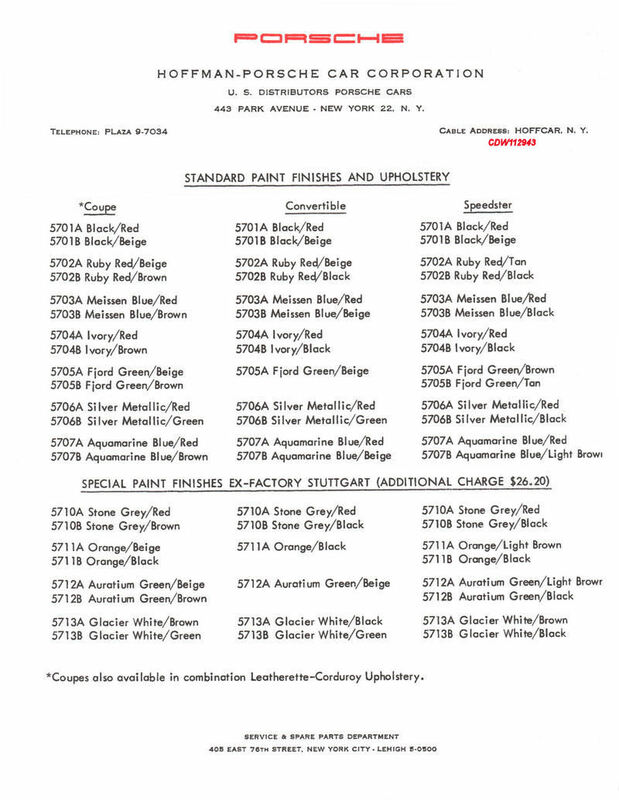 Listing of factory colors including paint numbers and door plate numbers from 1950-1965. 4. Exterior Paint Colors/Interior Color Combinations. 5. Some "Paint Popularity" statistics: what paint colors were utilized the most? 6. A discussion of "Paint Formulas" in today's restoration scene. 8. And............"Eyes on a Cab". The first two numbers of the four number color code are the model year the color was available. A listing of paint colors by Porsche in early 1957 listed the above seven standard colors, and four new colors referred to as SONDERFARBEN, "Special-Paints". The above 1956 paint numbers were re-numbered 5701, 5702, 5703, etc. The following special paints were available for all models at a slightly higher price. A later 1957 factory color chart, shown below, had a few changes compared to the 1956 color chart. Polyantha Red #5602 became Ruby red #5702, Graphite Metalic #5603 became Meissen Blue #5703, Sahara Beige #5604 became Ivory #5704, Lago Green Metalic #5605 became Fjord Green #5705, and Aquamarin Blue Metalic #5607 became Acquamarin Blue #5707. It's uncertain whether the later Acquamarin Blue was metalic or not. A side note to the color listing mentioned above, it indicates that the convertible tops for cars painted Black and Auratium Green were beige. All the rest of the colors came with black convertible tops! Below are color lists for Model Year 1958 from two separate sources. The first is from Hoffman-Porsche Car Corportion, the U.S. 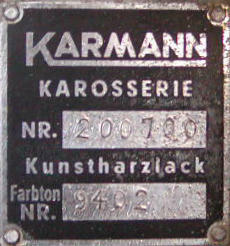 Distributor for Porsche Cars, dated September 1, 1957. The second is from Auto Europe, Inc. of Beverly Hills, California, New York, Chicago and Paris, and was apparently an importer and dealer of 356 Porsches. In their price and color lists for 1958, they described the "standard color combinations" for the various 356 models for 1958. Hoffman-Porsche Car Corportion, U.S. Distributor for Porsche Cars, September 1, 1957. Auto Europe, Inc., New York, Chicago & Paris, European Distributor, January 21, 1958. 1960 and the new 356-B brought several new paint colors, including signal red #6011, Aetna Blue #6003, Slate Gray #6001, Heron Gray #6007, Condor Yellow #6010, and Royal Blue #6012. See exterior paint, interior color combinations below! 356-B T-5 Exterior Paint Color - Interior Color Combinations for Coupe, Cabriolet & Roadster. The 356 B T-6 changes brought four new colors including: Oslo Blue #6203, Champagne Yellow #6205, Bali Blue #6212, and Smyrna Green #6210. 356-B T-6 Exterior Paint Color - Interior Color Combinations for Coupe, Cabriolet & Roadster. In the small print it says: "Cabriolet (also with removable top) Interior: Seats in leather only"! New 356-C colors include Sky Blue #6403, Irish Green #6406, Dolphin Grey #6410, and Togo Brown #6411, which are also designated as Special Colors. color charts are beginning to show up on Ebay and elsewhere! 356-C Exterior Paint Colors - Interior Colors - Carpet Colors - Top Colors - for Coupe & Cabriolet. Comment: The above are the standard factory color combinations as shown in the color charts and the interior fabric and carpet sample books. It is well known that factory customers could order special interior/exterior color combinations. So what is "correct" is either the above listed combinations, or whatever it says on a particular car's factory kardex. 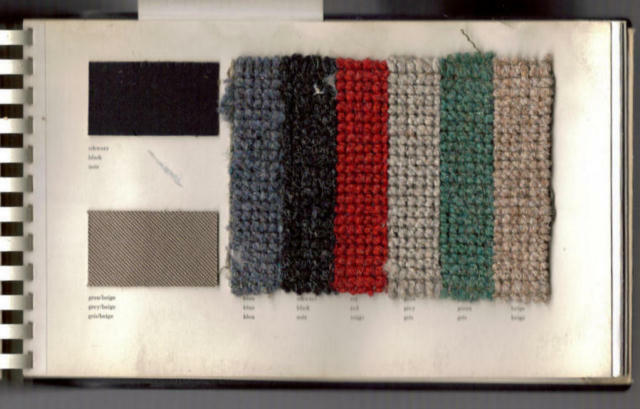 Unfortunately, I cannot make a better scan of these carpet samples as they are still inside the sample book. The two samples on the left are Cabriolet top samples, black and grey/beige. The carpet samples, from left to right, are: Blue, Black, Red, Grey, Green, & Beige. The colors as shown, are pretty accurate for a scan. I scanned the page for maximum resolution, but the carpet samples are thick and made the writing under each sample less clear, but the colors are pretty accurate, looking at the scan and then at the originals. Porsche 356 Paint Colors: 1950-1965! 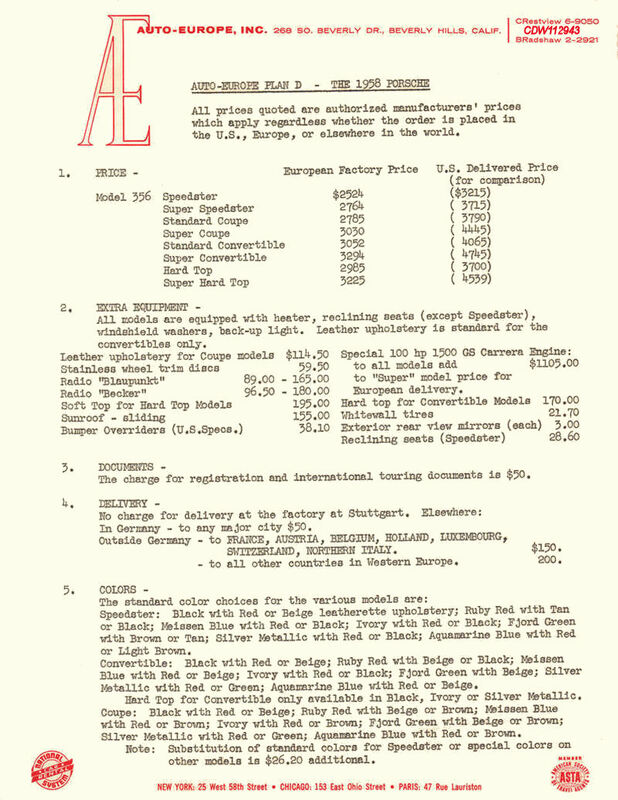 Note* Additional colors added 12/28/04, Porsche Price-List-Export P1, January 1, 1957. Note** Listing by Brumos Porsche, 1963, shows this color as Aquamarine Green. catalogs, there is a listing for special order paint. The accessory number is #9402! Alphabetical Interior Color Codes used on Color Charts & some Kardexs! Recently questions were raised about the alphabetic interior color codes found on some Kardexes. These Porsche factory codes also show up on factory color charts. So in addition to factory exterior paint color codes, there are factory alphabetic interior color codes to identify the available colors of interior upholstery, i.e. seats, door panels, dash tops, etc. The above table shows the REGULARLY OFFERED factory interior color codes for 356 B's and 356-C's 1960 to 1965. This is NOT to say that there weren't other interior colors available as SPECIAL ORDERS, throughout the B/C production period. Most know that if you had the GELD, you could probably get any color you wanted! Below are some statistics on exterior paint colors as published at various times in the factory magazine, Christophorus. It is interesting to note that Silver declined in popularity during the period, while Ivory increased slightly, and Green increased substantially. Another article in Christophorus indicated that according to tests conducted by Porsche, Red and Yellow were the safest colors. Paint Formulas for 356 Porsches! Now, these are actual color formulas for the factory color Ruby Red (6002 & 6202). If you can make any sense out of them, have at it! They are all Greek to me! and lots of other 356 stuff! Always looking for additional information to include in this website. If you have interesting information not shown here, please contact me at the below address. Name credits given for all material used in the website!